Hello my name is Dan Ryan and thanks for stopping by Homerica Inspections web site. 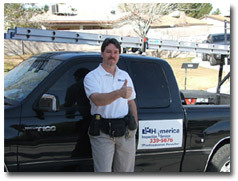 I provide Property Inspection Services in the Las Vegas and surrounding areas. The greatest value I can offer you is that I really love what I do. This alone attributes to “A Job Well Done”. I am a true professional and a walking book of knowledge with a common sense approach to inspecting. • Check out “My Qualifications Page” for more. The reports are produced using a professional inspection reporting software program, which produces professional uniform terminology and pictures. Go ahead and check out the rest of my website, it is filled with valuable information on questions you may have or if you prefer a personal touch, just give me a call…702-339-5676. If I do not answer this typically means I’m talking with a client about their potential home or maybe crawling through an attic (fun stuff), so please leave a message and I will return your call promptly. My advice and recommendations do not end with the inspection; you are welcome to call me anytime after the inspection. call Dan Ryan at 702-339-5676.